Raggle enjoys his apples. This was only a few weeks after they arrived on the yard. 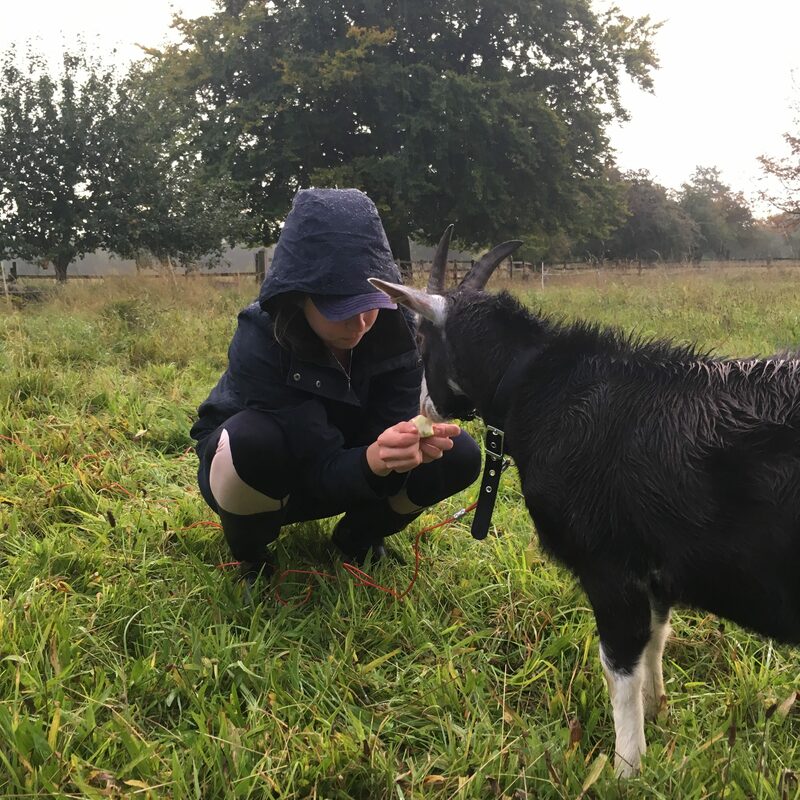 Both the billy goats have grown considerably in size and horn length. Just up the road from where I live is the place where I keep my horse Kiwi. The House there used to be the manor house of our village and is now lived in by a few different families. There is a small cobble-stone yard with an old stable block and a number of fields stretched around the sides of the house. There are a few barn buildings scattered amongst the fields and an old dove cote which is now home to chickens. 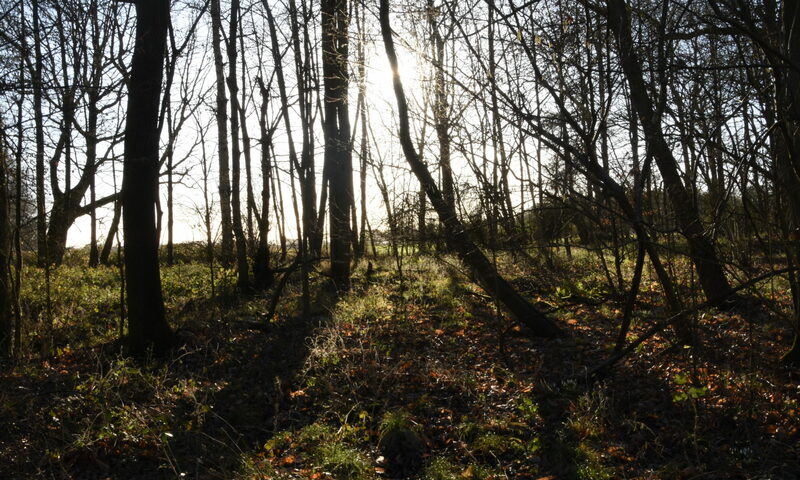 There is a tree nursery, a small orchard of apple trees and at the end of the property a woodland with two large ponds. Adjacent to the front of the house is the village church. Kiwi has been resident at the big house since 2015. I used to keep him with our family pony Bud in a field opposite our house. When Bud died in February of that year, Kiwi spent a week calmly processing the loss of his friend. After seven days however, he realised he was alone in his field and started to panic. It was clear that he needed company. 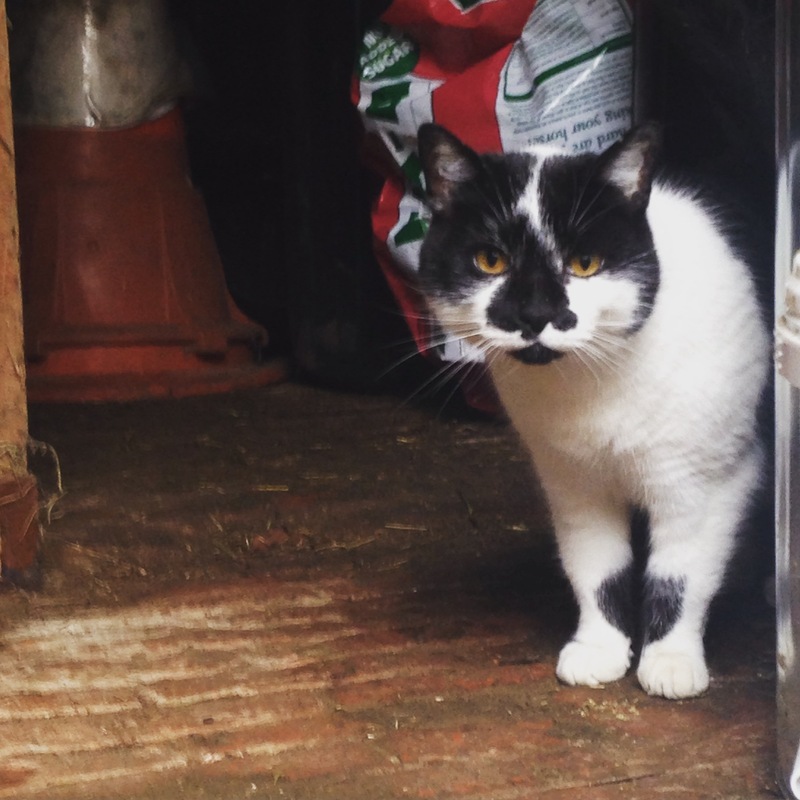 He moved up to the big house and joined three thoroughbred ex race horses and a small furry pony called Jinx. They all get on well and particularly enjoy chewing on each others rugs and bossing each other about, as well as generally keeping each other safe as a mini herd. As well as chickens, there is a small herd of sheep who share fields with the horses. 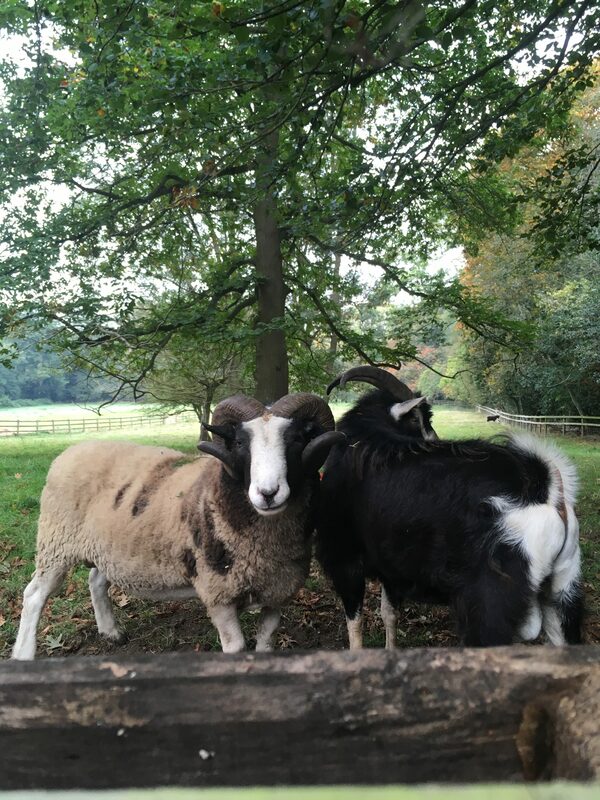 A rather magnificent Jacob’s ram called Cicero and a yard cat called Pirate. Pirate is supposed to keep the rat population under control but he rather prefers eating prepared dinner out of a tin. The cheekiest of all residents by far, are the two goats. 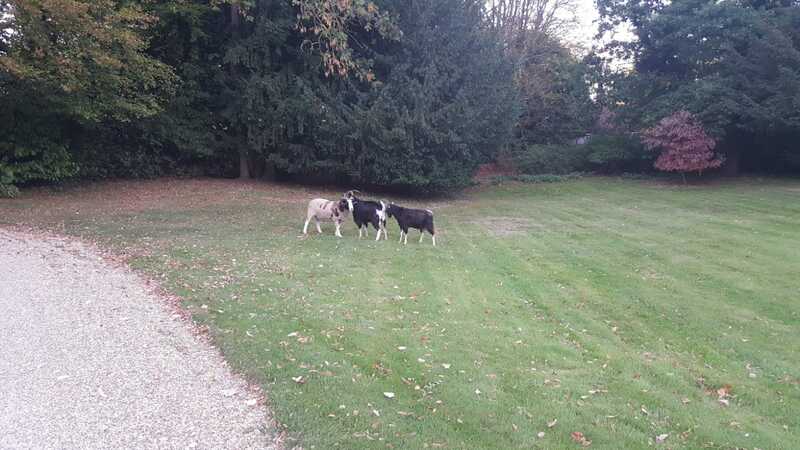 The two billy goats; Raggle and Mr Tumnus, are in a paddock with Cicero the ram. Cicero is very good at bashing his horns into the gate and creating a hole through which he can escape. This is somewhat of a problem, but only because both the goats can jump the fences of their paddock and he wants to go wherever they go. They frequently take themselves on jaunts around the fields and the woods. Thankfully the three rascals are easy to round-up and will follow anyone anywhere for the possibility of some tasty sheep nuts. 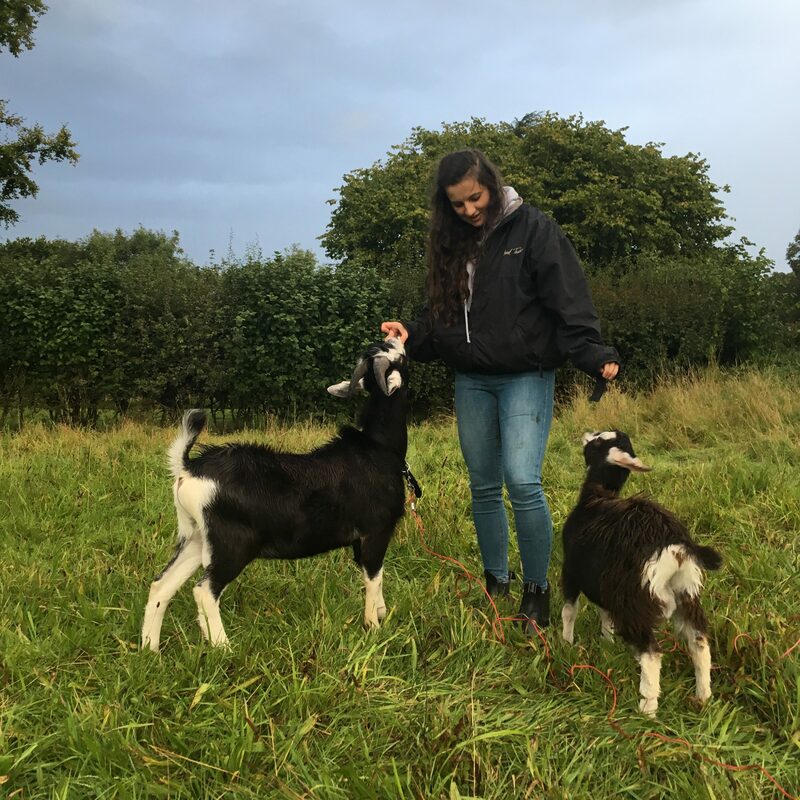 Both Raggle (big) and Mr Tumnus (little) were tethered on lines in the field and stabled at night until they were old enough to live out fully. Cicero and his magnificent horns. Although slightly intimidating looking, he’s very friendly. One time the goats escaped by jumping onto a log pile and then the fence. They left their paddock, sauntered to the front lawn and started chewing a tree. I received a text message about the escapees and by the time I caught up with them, they were happily ensconced in the church yard, to the bemusement of the gardener who was mowing the lawn. Cicero promptly followed suit and slightly less subtly left the field (by bashing more gate bars down) to join his companions. 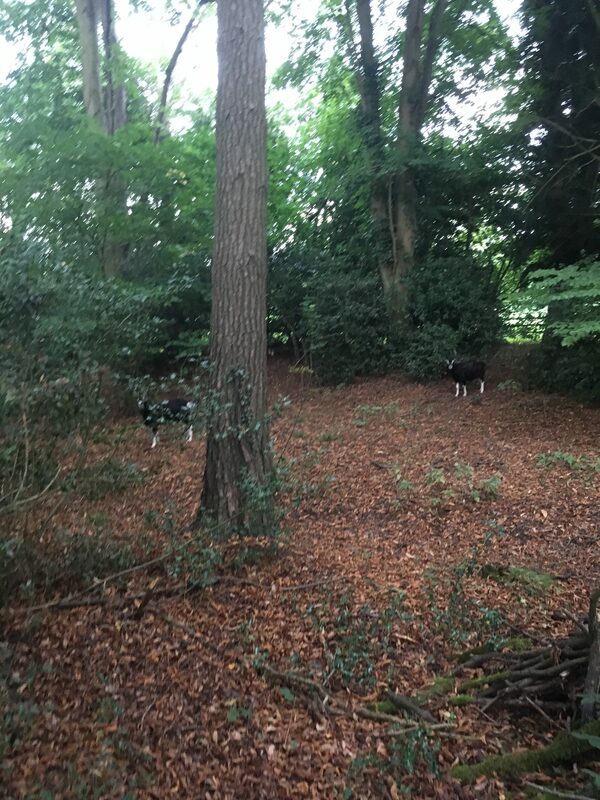 The goats on one of their self conducted walks in the woods. Last Tuesday evening, on my way to feed Kiwi, I heard what sounded like gun shots. It was actually Cicero ramming (now the name makes sense) his head against the wooden fence posts of his field to try to reach two naughty goats on the other side. I managed to chase Mr Tumnus back into his field through the gate to the eagerly awaiting Cicero. On seeing the other two on the field side of the fence, Raggle hopped with amazing elasticity onto and over the fence back into his field. I almost can’t believe what I saw. These somewhat clumsy animals are in fact amazing gymnasts. Give them a bar and a vault (but hold the leotard) any day! None of the above animals are supposed to be on the front lawn. ever. Cicero’s first hole with a pallet strapped in front and held in place with wooden posts. 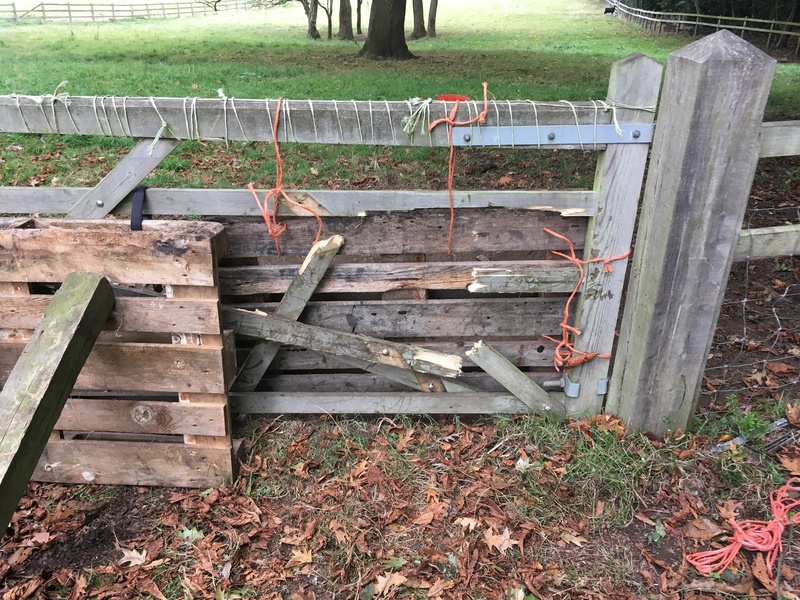 The second hole with another pallet tied in place. How long this gate will last I don’t know! I think the answer is, goats need much higher fences than you’d think. Our two troublemakers seem to think of their fence as more of a challenge of their climbing skills than the boundary of their territory.